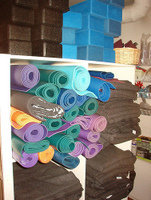 Yoga Exercise Equipment; Yoga Mats, Blocks, Props, Socks, etc. In the yoga world, and for your own personal practice, yoga exercise equipment may not always be necessary. We can practice yoga just about anywhere, anytime. However, a good yoga mat and some props can make a big difference in how effective and enjoyable your practice can be, especially if you are a beginner. If you are doing an intense, vigorous practice, your yoga mat can make or break an advanced asana routine. The following pages will give you information and recommendations for yoga exercise equipment and suggest great resources for many other yoga essentials to enhance and improve your practice. There are literally thousands of places to get mats, blocks, straps, etc. It's not necessary to spend a fortune on blocks and straps, but a good mat is very important. Let's see what kind of yoga props and yoga exercise equipment is available. The subject of yoga mats needed its own special space. Go to the Yoga Mat Page for a review of several different yoga mats best suited for your particular yoga practice. Yoga Blocks are used to assist, support and align the body in difficult poses when your flexibility is limited or if you have any other disability or bodily limitation, injury, pregnancy, etc. They come in a variety of colors and materials. Like mats, they can be made with toxic materials or can be eco-friendly. Choose wisely. Yoga blocks are rectangular wedges commonly made from foam, wood, or bamboo. They are sometimes referred to as Yoga Bricks due to their brick shape. Each yoga block offers three dimensions (measurements are usually 5 inches x 9 inches x 3 inches). Yoga blocks are used to aid and support particular parts of the body to help with the correct alignment of a position. Care must be taken when using blocks not to become too dependent on them, using them as a crutch. We may get so used to using them that the body will never fully expand to its capacity. However, their use is of extreme benefit for alignment and stability when used properly. Yoga straps are used to assist in aiding flexibility when it's hard or impossible to reach certain parts of the body, like in a seated forward bend. If the toes cannot be reached, a strap is used around the balls of the feet. Yoga straps are made of non-flexible cloth material and may have a plastic buckle for fastening. Yoga straps are especially designed for maintaining a pose and to stretch muscles more effectively, however, any kind of strap or towel can be used to further facilitate a stretch. Like mats, there is a vast assortment of yoga bags. Some are just basic bags shaped like a rolled-up mat for easy mat carrying. Others are elaborate and have bottle holders and compartments or pockets for holding items like towels, yoga accessories, CD's, keys, sunglasses and whatever you bring to your class. Not everyone needs to carry extra items. You can keep it simple and just use a yoga strap for carrying your mat. Feel good about shopping at YogaAccessories.com. With every order placed YogaAccessories.com will plant a tree! In addition to helping the eco-system by planting a tree, Yoga Accessories.com has a large variety of yoga exercise equipment at very discounted prices! Check out their large selection of yoga essentials. Not all the mats offered at Yoga Accessories.com are Eco-Friendly, so be careful when ordering mats to make sure you are looking in the Eco-Friendly section. JOIN THE TOE SOX REVOLUTION! So what is a foot revolution? The liberation of your feet. The ability to spread your toes. Wiggle room. Spacious, breathing, strong, enlightened feet. Yoga-Pilates ToeSox with patented non-slip grip are great for yoga, pilates, dance and martial arts, as well as any other barefoot activity. Sport-Sandal ToeSox without the non-slip sole are the same sock - no grip. Great to wear in your athletic shoes or sandals. The five toe design promotes toe strength and flexibility by allowing independent movement of your toes. Foot freedom. Happy feet. Good stuff. 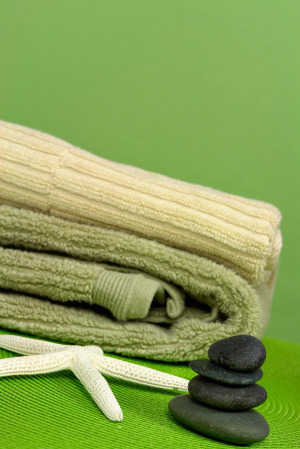 Read more about taking care of your feet! This free website is my personal work of art and a labor of love. It takes time, money and hard work to make a great website that is educational and inspirational. Any products mentioned are recommended because I truly believe in their quality and value. Please be aware that if you buy products through some of the links in this site, I may receive a small commission from the company as a thank you for my support to the providers of those products. That commission is not passed on to you, but is paid for by the company, and is not added on to the price you pay. Your continued support and use of the beneficial information in this website is very much appreciated.